This projectile point is a spear tip. 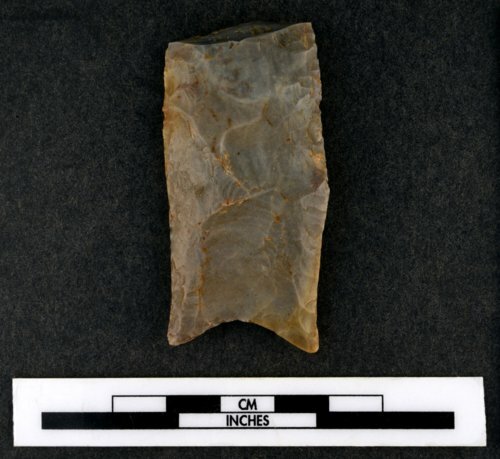 It has a long flake scar called a flute on one side of its base that suggests it is Early Paleoindian, but it also has other characteristics that are common to the Late Paleoindian points. It was found along Mill Creek, possibly in Wabaunsee County, and donated in 1925. Paleoindian people were mostly highly mobile, small bands that hunted large game. Not all artifacts fit into neat categories, but the fluted base, shape, size, and manufacturing qualities indicate it is very old.